. If you want a quick answer, please list the subsequent specifications in your request: quantity of travellers, place to meet and place to end, preferred route, dates and times. In line with these specifications, we shall carefully answer you with a quotation for your bus travel in Germany and all around Europe. Through our company, you and your travelmates can reserve various types of vehicles with operator. In confirmity with the size of your tour group, our agency is willing to help you book passenger vehicles of any volume for your tour in Rhineland-Palatinate. Our company and our partners invite you to pick among the many different bus sizes. Regardless of your decision, we can assure to use trustworthy buses, minibuses and microbuses from Rhineland-Palatinate for your travel party. For those customers who want to charter a regular automobile, a vintage street car, or a limo, we want to send you any type of automobile with a chauffeur in Rhineland-Palatinate. With equal pleasure, we can also take you to North Rhine-Westphalia, Wallonia (Belgium), Saarland, Grand-Est (France), Baden-Württemberg, and to places in entire Germany. For street tours of small and medium numbered traveller groups, we offer small and tiny coaches with operator in Rhineland-Palatinate. Moreover, our vehicles can also be ordered for a journey to Luxembourg, to France, to Belgium, to Netherlands, to Switzerland, as well as for tours to all other countries in Europe. If your group consists of many people, we can send big coaches and two storey motorbuses with motorist for all bus trips within Rhineland-Palatinate as well as in all cities and regions of Germany. Of course, you and your guests can charter our well-maintained vehicles for international rides beyond the territory of Germany, for instance to the closeby countries of France, Luxembourg, Belgium, Netherlands, and Switzerland, or to other destinations in Europe. 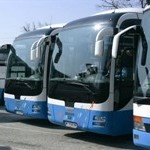 This website is operated by the coach company "City Tours GmbH - Deutschland". To learn more about City Tours and its coach hire service, please visit our legal notice page.